Mango Point is nestled on a lush tropical hillside facing the Caribbean Sea and the famous Pitons: twin titanic peaks, soaring to a height of 2900 feet above the cobalt sea. Lovely beach is 15-minute walk downhill. Red roofs, thick stone island walls and graceful archways set the tone for a colonial house. Villa is not air conditioned as at 300 feet above sea level, constant breezes cool the house. It has 4500 square feet under cathedral ceilings graced by hand carved beams and ceiling fans. Separate wings for sleeping, dining, cooking and leisure are wrapped around a courtyard shaded by fragrant jasmine vines. Entering the house into the living room you are irresistibly attracted by the large arched doors framed by bougainvilleas, few steps down,the swimming pool follows the line of the cliff, the view is breathtakingly magnificent as it sweeps across the Soufriere Bay, sea, and mountains. Rental fee includes an excellent chef and an housekeeper daily services.The staff will shop for the guests provided the cost is given by the guests for each shopping trip. Just off the living area, five steps down suspended at the edge of the hillside, a large infinity swimming pool faces the majestic Pitons. Large decks with sun chairs are sheltered by a cabana. The dining room and living room are really comfortable and elegant. Imported Ralph Lauren furniture includes sofas, large rugs, toile curtains, art, and a hammock. Candlelight or al fresco dining can be arranged. The sleeping area has more a West Indian flair with four poster beds and gauze netting, contributing to a romantic feeling. Two of the master bedrooms have colonial king size mahogany beds. A few steps down in the garden is the third master suite, Creole-style, with a queen size, ironwork four poster bed. This room enjoys magnificent views from its deck. All oversized, these bedrooms have large closets, a safety box, ceiling fans, and quality linen. A cot bed is also available in one of the master bedrooms. Spacious bathrooms en suite have three walls, with showers and separate toilets. The fourth bedroom, situated in the service area, with twin beds and bathroom can accommodate two more. The large kitchen is Mexican tiled and is well-equipped with a microwave, two fridges, one freezer, a toaster, blender, barbecue grill, and an adjacent laundry room with a washing machine. Our dedicated staff really adds to the pleasure of staying at Mango Point. Pamela our housekeeper is an excellent cook and will surprise you, she knows too how to mix drinks. Felicia, the housemaid keeps the house orderly, prepares breakfast and light lunch and does the house laundry. Both are warm and reliable persons and will do their best to make your stay a memorable one. Much care has gone into quality, comfort, art, and details which add to the charm and pleasure of your stay at Mango Point and makes it so special to our returning guests. A VCR, stereo, books, tapes, and CDs are available during your stay. Included in the rates are the daily services of an excellent cook, a maid and a gardener. Food and beverages are not included in the price. Staff is mandatory. Baby sitter and massage services are available upon request. Included in the rates are the daily services of an excellent cook and housekeeper. Food and beverages not included. Airport transports to and from the house can be arranged, fares are directly payable to the driver. Our family of five returned to Mango Point for the third time in 10 years, although it had been 7 years since our last visit. This is a special place where we all recharged after 7 nights. 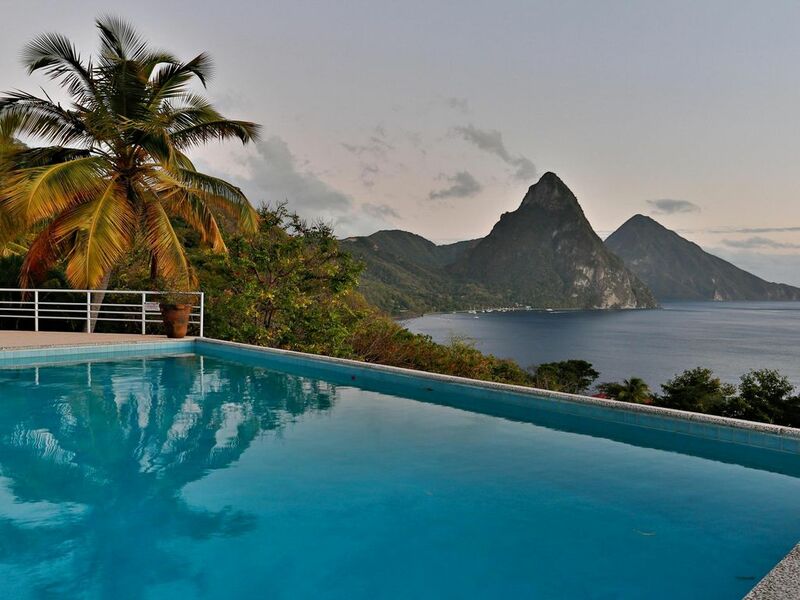 The views and setting of the property are excellent and we spent hours each day in/around the pool staring off at the Pitons and reconnecting as a family. We used the two master suites as well as the lovely cottage. Our 16 year old - only 6 on his first visit - happily slept in the cottage and enjoyed his privacy. The team that cares for this villa feels like family. Jones met us at the airport and played our favorite music on the drive to the villa. He also shuttled us around when we explored the island, although we have learned that the best place in St Lucia is this villa and have limited our excursions. Each time I’d call Jones, he would say “no worries, my brother” and made us instantly feel relaxed. Pamela’s cooking was amazing, as usual. Mahi mahi, honey chicken, cheese soufflé, delicious soups, and many other wonderful dishes were enjoyed while we watched the sunset. Felicia and a new lady, Theresa, made a delicious breakfast every morning, cleaned the villa, washed our laundry, and fixed a light lunch and pina coladas. Mango Point remains the one place where we continue to return and we promised ourselves that we won’t let so much time elapse until our next visit. Thank you for allowing us to visit! We just returned from a week in paradise! Each year, a group of us (all college friends) select a new destination to reconnect. This year, we selected Mango Point and all we can say is, "WOW!" Mango Point exceeded our expectations in every way. We thoroughly read all the reviews before selecting this house to stay at, and the reviews pretty much described the pure joy in staying at this property. So first, the house is spectacular. As many of the other reviews suggested, the photos don't do the house justice. It is "open living" which makes it feel like you are in a luxurious treehouse. The view of the Caribbean Ocean and the Pitons are amazing. Next, the staff; where so we start? Pamela is the sweetest and most amazing cook. She went above and beyond in preparing the most incredible dinners for us. Felicia, equally as sweet and skilled at preparing delicious breakfasts and lunches was a joy to have around. Initially, we were concerned that having "staff" around might impede on our privacy but we all agreed that that was not the case. They arrived and did their tasks without us even realizing they were around. Remi and Lia were also very sweet. Jones, the driver was awesome! We would highly recommend using him for all the transportation needs. We did not rent a car and are glad we didn't. The roads are steep, unmarked and driving on the opposite side of the road may have presented a challenge to us. Also, the need to not rent a car proved to be a good choice as we never wanted to leave Mango Point. We only went out to eat once; the second time we thought to go out for dinner, we canceled because Pamela's cooking was just too darn delicious! We did go to Ladeera one evening for sunset cocktails and dinner. We would highly recommend this as the location is nestled right between the 2 Pitons and the sunset was extraordinary. We hiked the Gros Piton one day. A word of caution: this is a CLIMB, not a hike! It was strenuous and if you are going to go, go early in the morning as Jones suggested to us. We arrived at 7am and were very glad we did. We were also extremely glad that we did the climb as arriving at the top is an experience like no other and quite the sense of accomplishment. We used the services of Maura, the massage therapist who came to the house. We have experienced plenty of massages and she was one of the best, EVER! All in all, you will not be disappointed if you choose to rent Mango Point. It is truly a slice of heaven. Thank you dear Lynn, for taking the time to write these kind words about our home in St.Lucia and our dedicated team, they loved having you. We are all so glad you enjoyed the house, views and whole experience. Mango Point was an amazing property to stay at. My husband and I along with two other couples stayed here and upon arrival were impressed with how beautiful the property is . Pamela and Felicia cooked delicious meals and made sure our stay was comfortable and relaxing. The house is very clean and perfect for a getaway. The driver Jones was awesome. He made sure we got where we needed to be and helped us navigate the island. We were very pleased and would definitely stay at Mango Point again! Thank you for writing such kind words of your stay at Mango Point. We are so glad you enjoyed the house , its views, our dedicated staff services and the whole experience. Looking forward to having you back again anytime. A peaceful and tranquil place for a wonderful holiday. The staff were all friendly and helpful and willing to answer questions and provide useful local information. Pamela's recipes were always fantastic and her Pina Colada a treat and Emannuel does a wonderful job with the grounds and gardens. Thank you John for writing such a kind review. I am delighted that you have enjoyed your stay at Mango Point, the house views, our dedicated staff and the whole experience. Had to be the best view ever. The service provided by the staff of 4 was amazing: Great cook, housekeeper, gardener and driver... and all part of the rental. We just bought the food (or actually the cook bought the food and we reimbursed her) based on menus that we coordinated. The villa is very nice and ultra clean. It's an older style, classic villa. Very open, thick walls, great air circulation. The road to the place is rough but there's a big pay off. Definitely recommend taking advantage of the driver, especially for airport pickup. TAXES, COOKING, CLEANING ARE INCLUDED IN ALL RATES. FOOD COSTS ARE ADDITIONAL.